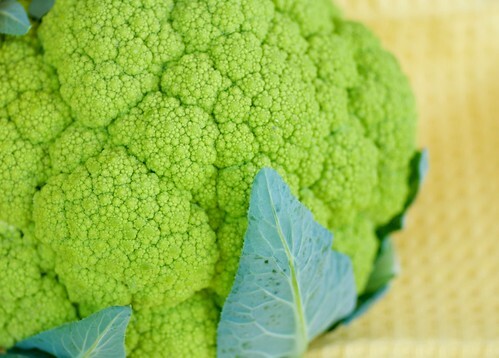 Food Blogga: What is Broccoflower? Broccoli and Cauliflower's Wild Child. What is Broccoflower? Broccoli and Cauliflower's Wild Child. Can two duds mate and create a beauty? Yes, they can. Look at broccoli and cauliflower. For years these unassuming, cold-weather crucifers have withstood derision. They have been called bland, boring, even, smelly. Unfair, yes, but true. Then one day broccoli and cauliflower shocked the world: They got together and produced a wild child, which they named, rather predictably, broccoflower. Broccoflower resembles its parents in shape, texture, and flavor, though it can sometimes be sweeter. Its color, however, is radically different. Broccoflower's psychedelic lime green coloring stops market-goers in their tracks. So too does its price, which is typically $4-5 a head. It's funny though how most people who wouldn't dream of paying $2.99 for a head of white cauliflower will gladly fork over $4-5 for a head of broccoflower. Cook and eat broccolflower as you would broccoli or cauliflower -- raw, steamed, boiled, broiled, roasted, or sauteed. Cooking it al dente helps maintain its vivid color and crisp texture. For a fast, delicious, and healthy mid-week meal, try this Easy Chicken Saute with Broccoflower, Sun-Dried Tomatoes, and Olives. 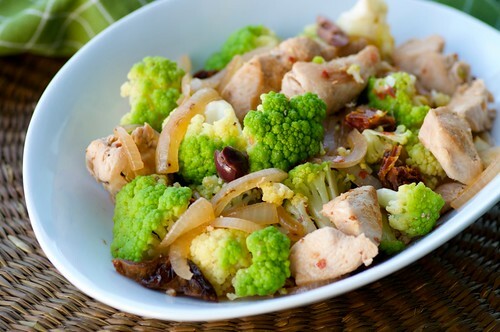 Broccoflower's sweetness is accentuated by pungent onions, rich sun-dried tomatoes, and briny olives. Despite its humble lineage, weird name, and supernatural color, there's no denying, broccoflower is a cruciferous starlet. Feel free to add a couple of drops of vinegar to the water as you par-boil the broccoflower to help maintain its vivid color. 1. In a large skillet over medium-high heat, heat olive oil; add onions and saute until translucent, about 3 minutes. Season the chicken with salt and black pepper; cook until browned all over yet still tender, about 8-10 minutes. 2. Meanwhile cut broccoflower into florets. Place in a large pot of boiling water for 3 minutes; drain. 3. Once chicken is browned, add the broccoflower, cooking until browned in spots. Add white wine (the alcohol will burn off, but the food will be infused with its flavor). Once the alcohol reduces, add the vegetable broth, sun-dried tomatoes, and olives. Reduce heat to medium-low; cook for 10-12 minutes. Turn off heat; stir in fresh rosemary and season to taste with salt and freshly ground black pepper. You could also sprinkle a little freshly grated Parmesan on top. It is so beautiful! That dish must taste really good! Mmm! And this is in season right now! I've seriously been meaning to try this. I already like broccoli and caulifower. Funny story - a few years ago, I decided to buy fresh cauliflower for the first time ever (yes, I grew up in a frozen-veggie-only household.) I couldn't figure out why the heck it was gree! But I went along with it anyway and later figured out I had actually bought broccoflower. Broccoflower! I've seen an even crazier looking broccoli-cauliflower hybrid at the farmers' market in NorCal. It's called romanesco and looks so spiky! I really have to try this. I can eat broccoli, but have never liked cauliflower, so perhaps the offspring of the two together would work for me. Your recipe for broccoflower sounds delish and so easy. I wonder what my high school students would think. I would probably be the talk at the dinner table! Love it! I'm a fan of all the relatives of broccoli and cauliflower. Gorgeous color. I actually love broccoflower for crudite and dip plates at parties. Not only does the crazy color add a lot of visual punch to your plate, but the slight sweetness of the broccoflower is actually delicious if you're using a tangy dip! Never has the sating "eat with your eyes" wrung so true. Good for novelty! But I'm assuming it's no more nutritious than regular broccoli or cauliflower? I have to look for one of these! I'm trying to mix up my fruits and vegetables. I get in the habit of eating the same ones over and over and that's not good nutrition wise. And not very exciting either. My daughter used to refer to broccoli as a "green cauliflower". Now it turns out there actually is one!